Extra police presence is planned for the remaining two nights of Lane Tech High School’s Memorial Day Carnival after a series of violent incidents broke out on Saturday evening. One teen was beaten by more than a dozen offenders and another was punched in the face and robbed, according to police reports. Around 8:30 p.m., a police officer reported seeing a group of 40 people fighting in a grassy area next to the carnival grounds at 2501 West Addison. When the crowd broke, officers found a 15-year-old boy had been beaten in the attack. A police spokesman said that the victim apparently intervened when a group of 15 to 20 teenagers tried to take his friend’s bike. The boy was surrounded by the group of offenders who struck the victim repeatedly while he was on the ground, police said. The victim was transported to Lurie Children’s Hospital. No one is in custody. Area North detectives are investigating. During the same incident, a woman reported that a group of teenagers stole her phone. Police tried to help the woman recover the device but no police report had been filed as of Sunday morning, police said. 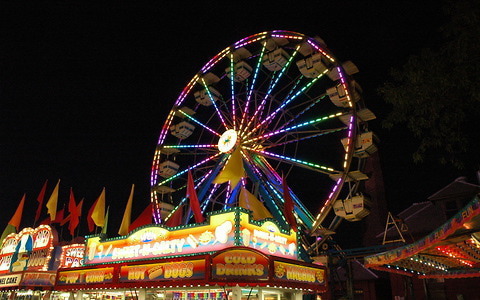 Later, around 10:10 p.m., a 17-year-old boy was punched in the face and robbed of his valuables by three teenagers near the carnival, police said. Cops were able to track the victim’s phone to a nearby McDonald’s where one offender was taken into custody and the boy’s property was recovered. Police said a 16-year-old juvenile arrested at the restaurant has been charged with felony aggravated robbery. No further information was available about the offender because he is a juvenile.